We were going to do SUYL Christmas cards today but I haven't sent all my cards out yet so I'm not ready to post and I thought it would easier if we joined up on my friend Faith's blog - who is having a Christmas card carousel! We will be taking a little break and pick back up on SUYL Fridays after the new year. I'll try to post a list of topics soon! I hope to have some really fun ones! Last night Scott and I took Harper to the mall to see Santa Claus. Last year went really good and I really thought she would do so good. She is never scared of anything or shy so I just knew she would love Santa. She also calls all older men "Pap-pa" or "Papa" and loves to smile and wave at them so I just thought she would be so friendly. While we waited in line - I kept her busy riding the little cars. I would never laugh at my child in pain or who was upset - but I have to say - this picture is hilarious. I'm pretty sure I will pull this out every year and laugh for the rest of my life. I just think it's priceless. 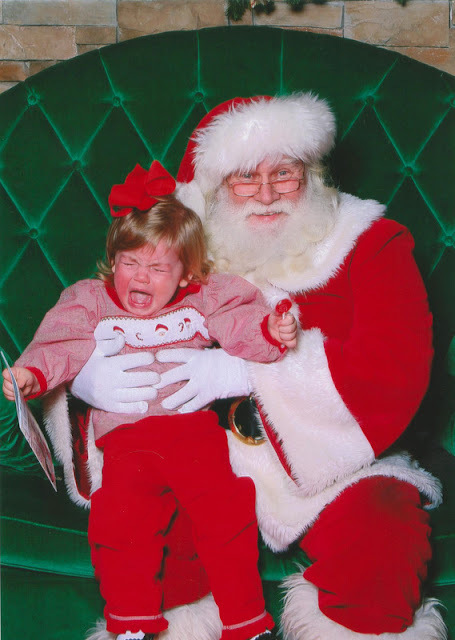 I think it's just this age - most kids hate Santa. I was just so shocked that she hated him so much. I love our outdoor mall - it's so pretty at Christmas. Today was Harper's last day of MDO until after the new year. I was able to get all our Christmas shopping done while she was in school! We aren't doing very much so that made it easy! I went to pick her up early because they were having a Christmas party and I wanted to see her! She was so good while I was there! She used to want to hit kids but now she is into HUGGING! She ran around to every kid in the room saying "We hug?" Most of the kids were not into hugging her but bless her heart she was trying so hard. I love this stage MUCH better! This afternoon we went over to Laurie's house to exchange gifts. Emily was SO excited! Laurie got Harper a Fur Real Panda bear and she loves it. But she went CRAZY over the cat that Laurie's girls had. She was dancing and laughing and smiling. I think I know what she might get for her birthday! We got in some hugs before we had to go. Christmas time is a wonderful time!